Just a few blocks away from the craziness that is Piazza Navona sits the church of Sant’Agostino. 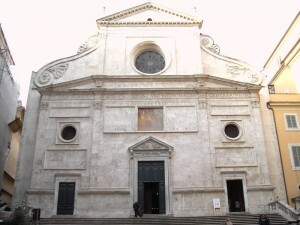 Originally, the titular church of San Trifone sat nearby. The property was given to the Augustinians and construction on the current church, dedicated to Saint Augustine, began in 1296. Just a few short years later, in 1446, the church as we see it today was completed. San Trifone remained as an annex until 1736 when it was demolished to make room for a new monastery. The façade, one of the earliest examples of Renaissance architecture, is made of travertine marble thought to be from the Colosseum. Inside are works from Bernini (the high altar and angels throughout the church), Caravaggio (Madonna dei Pellegrini), Raphael (Isaiah) and even an icon of the Madonna with Child that some attribute to Saint Luke. Just inside the entrance to the basilica is the Madonna del Parto, Our Lady of Childbirth. Often times the statue is surrounded by women. The Madonna del Parto is said to have miraculous powers over women having trouble with childbirth. For nearly two hundred years, mothers and fathers-to-be have come here to pray for Our Lady’s intercession, kissing her left foot at the conclusion of the prayer. All these prayers, well, the kisses really, have nearly worn away her marble foot. Saint Augustine often wrote about the allegorical meanings of numbers. The architect of this church took this into account. There are twelve arches, twelve side chapels and twelve windows. Just as in the Bible there are the twelve tribes of Israel and the twelve Apostles. There are twelve campate, or spans, across the the side aisles and three across the center nave, fifteen in all. For Saint Augustine, the Old Testament was represented by the number seven and the New Testament represented by the number eight. Together they equal fifteen. Oh, and they have relics too. Saint Monica, the mother of Saint Augustine is entombed in the chapel to the left of the high altar. Saint Tryphon, to whom the original church was dedicated, along with Saints Respicius and Nymphas are under the high altar. The martyrs Thomas of Villanova, John of Saint Faconda and Claire of Montefalco are here as well. Tomorrow we celebrate the first Sunday of Lent across town at the cathedral of Rome, Saint John Lateran.